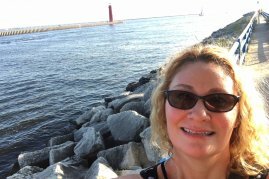 Deirdre Fagan is a native New Yorker who has lived in Arizona, Florida, Illinois, and Maryland, and currently resides in Michigan where she teaches and coordinates the Creative Writing program at Ferris State University. She has been teaching college writing and literature courses since 1996, and began her writing career publishing academic essays. She is the author of Critical Companion to Robert Frost and has published critical essays on poetry, memoir, and pedagogy, among other topics. She writes poetry, fiction, and creative non-fiction, and is also working on a memoir. She is a remarried widow and mother of two who resides with her charming husband, delightful children, and incredibly friendly golden retriever and tabby in a home surrounded by woods. Finalist for Best of the Net 2018 for the poem "Outside In," nominated by Nine Muses Poetry; Nominated by Constellate Journal for the 2018 Puschart Prize for the poem "Homesick"